This pages shows that the prizes that the Privacy by Design foundation has won with the identity platform IRMA. 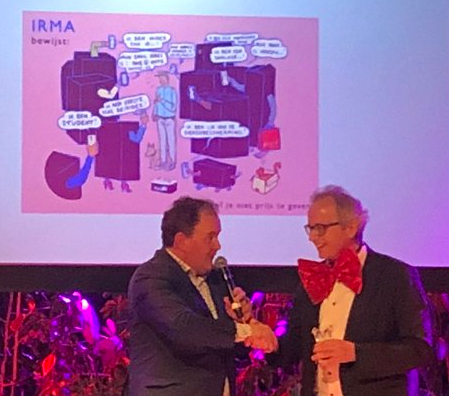 The Netherlands Chapter of the Internet Society has presented the identity platform IRMA with the Internet Innovation Award 2019. The award was handed over in Amsterdam on Jan. 17, 2019 by the chairman of the jury, Eppo van Nispen tot Sevenaer, to the chairman of the Privacy by Design foundation. Royal Holland Society of Sciences and Humanities (KHMW) each year awards the Brouwer prize for science and society. In 2018 this prize is awarded to the Privacy by Design foundation. The jury appreciates that the foundation gives people control over their personal data and thereby, in the light of all scientific developments, establishes trust in society. The scientific foundation of IRMA weighted heavily for the jury. The Brouwer prize involves a sum of hundred thousand Euro. The foundation Privacy First awarded in janary 2018 the Dutch Privacy Award to the identity platform IRMA. The jury commends IRMA’s privacy by design, its large innovative potential, and its potential social impact. The prize is an honourfull recognition of the IRMA’s strong focus on privacy protection. This prize does not involves prize money, but it does come with a sculpture, as shown in the image on the side.